A 59-year-old man was shot twice in the stomach, allegedly by his live-in girlfriend’s 27-year-old son, authorities reported Saturday. 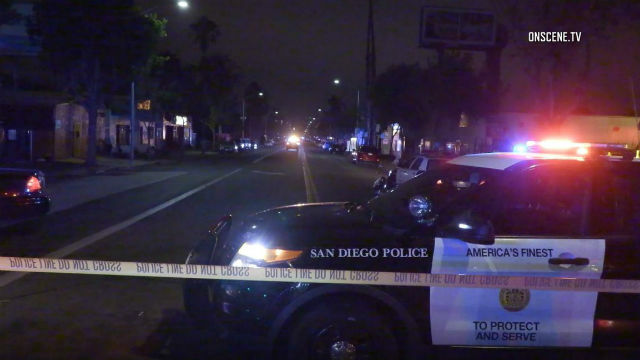 Officers were called about 11:15 p.m. Friday to the 2900 block of Imperial Avenue in the Grant Hill neighborhood and determined the man had become involved in an argument with his girlfriend and her son, according to Officer Steve Bourasa of the San Diego Police Department. During the argument the son produced a handgun and shot the victim twice in the stomach, Bourasa said. After getting shot, the victim fled the home and collapsed on the sidewalk, where he was found by officers, he said. The 27-year-old man was arrested at the scene and the victim was transported to a hospital for treatment of non-life threatening wounds, Bourasa said.